Between 1969 and 1972, a new type of archaeological site was created. For the first time, human bodies and the technology needed to sustain them altered the landscape of another world. The astronauts from the six Apollo missions left a suite of space-age artefacts behind on the lunar surface. And not only that: the missions brought to the moon new kinds of shadows, cast by machines and bodies and flags and rovers, in an interplay of movement and stillness. On Earth, the movement of living things, the changing of the environment, both natural and cultural; and the weather, which occludes sunlight to different degrees, make shadows very dynamic. Lunar shadows, however, are more passive at human time scales, their movement identical with the fortnightly passage of the sun over the surface. The Apollo missions brought shadows that were not so passive. The speed of the shadows differed, depending on the activity being carried out, and was much faster than the slow passing of the day. Some shadows were solid black and some were lacy and textured, reflecting the mesh on the umbrella-shaped antennas. They crossed and uncrossed with the angle of the sun and the movement of the astronauts around the tiny landscapes that constituted their lunar experience. The shadows were captured and frozen in many photographs of the Apollo missions; in these photos, they became another type of artefact. And then some shadows left, never to return, and others stayed to be swallowed by the lunar night and emerge into day again. The shadows of the objects left behind—descent modules, rovers, cameras and other equipment—will continue to be cast over the lunar surface until they decay in tens, hundreds or thousands of years. The objects don't move, but their shadows circle them in diurnal devotion, sundials without a mission. The Lunar Reconnaissance Orbiter (LRO), launched in 2009, used the shadows to detect the presence of these orphaned items of material culture. We've been able to get images of Tranquility Base, and the other landing sites, from the satellite flying over. 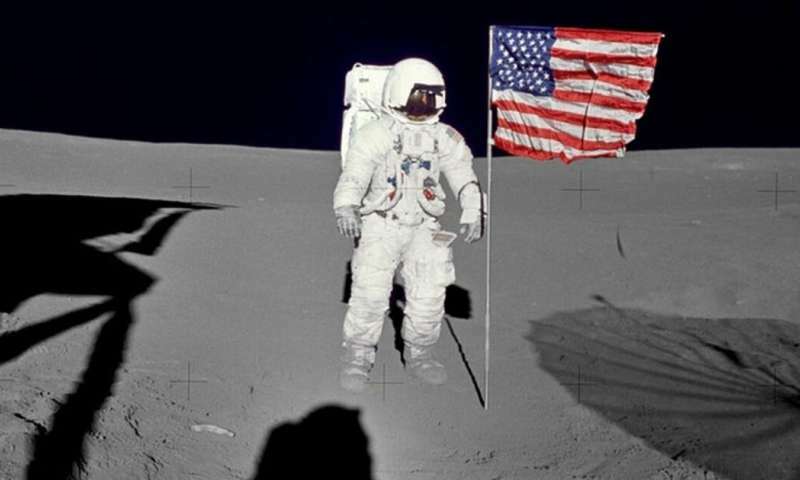 The famous Apollo 11 flag, planted in July 1969, is alas no longer standing, probably knocked over when the ascent module lifted off and blew dust all over the Dust Detector Experiment - a tiny cube made out of solar panels designed by Australian space scientist Professor Brian O'Brien. When we look at the moon from Earth, much of the difference in light and dark areas results from albedo rather than shadows. It was Sir Isaac Newton, in the 17th century, who established that darkness was not a positive force like light, and shadows were caused by the absence of light. Then there is chiaroscuro, meaning the contrasts between light and shadows – used by artists to create three-dimensional effects on two-dimensional flat surfaces. Chiaroscuro doesn't just occur on the canvas either: we use shadows in depth perception in everyday life. Shadows themselves are 2-D representations of 3-D objects. As I was scrolling through Apollo images in NASA's online archives, I noted the many shadow astronauts with elongated legs, present yet absent in the photographs they were taking for the audience back on Earth. They seemed so lonely and silent; and I was reminded of a well-known series of paintings by the artist Giorgio de Chirico. Around 1910, he started working on a theme in which shadows figured prominently. The paintings were often of empty town squares with statues, towers and arched building façades. The shadows were sharp and elongated and seemed at odds with the strength of the light. He wasn't using the shadows to create depth, but to subvert the conventions of "perspective illusionism". More than the physical perception, shadows are highly symbolic. They represent melancholy, concealment and secrecy. They symbolise death and the soul, the supernatural, dreams and ghosts, the underworld, coolness and rest on a hot day. Shadows are visible but not tangible. Their disposition varies with the angle of the light sources. I wondered if shadows had been a factor in considering the aesthetic values of heritage sites on Earth. My searches in the heritage registers of various countries did not produce much. Usually shadows were considered as part of the built environment, and their impacts were mostly characterised in negative terms, as shadows cast by more recent buildings could affect the perception of a heritage feature on an older building. There were two exceptions I found in the World Heritage List. Both referred to shadows cast by fortified city walls. These shadows created a sense of belonging and protection for the communities living within them. So there was some precedent for considering shadows as part of the fabric and cultural significance of a heritage site. It's 21 July 1969. Neil Armstrong is descending the ladder from the Apollo 11 landing module. As he sets foot on the moon, he utters words which have since become immortal.But he also says something else. "It's quite dark here in the shadow and a little hard for me to see that I have good footing." He had descended into something the moon had never seen before: the shadow cast by a crewed vehicle, the landing module. 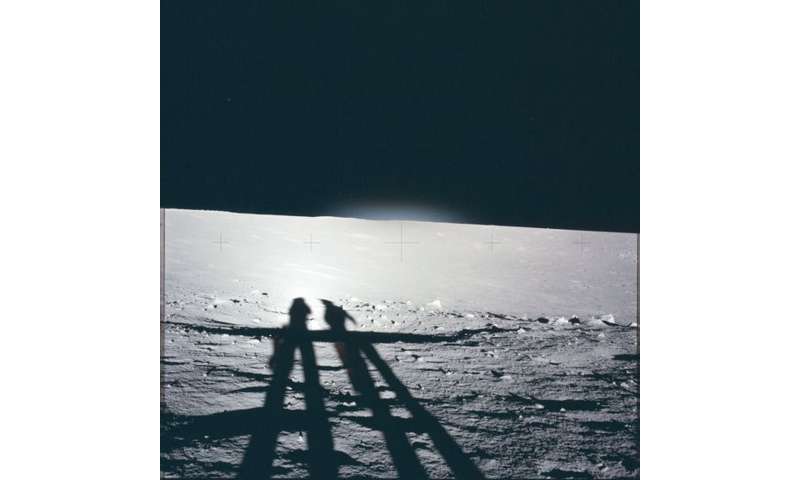 Shadows were to play a large role in the unfolding lunar mission. Landing the Eagle safely meant learning how to interpret what the shadows said about the unevenness of the terrain. 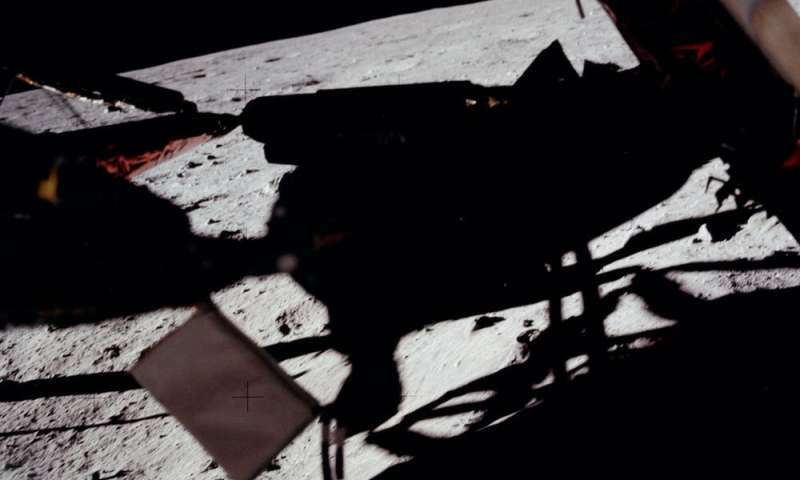 Armstrong and Buzz Aldrin had to conduct their scientific work in these unusual shadows, which often made parts of equipment that fell into their deep black invisible. But the shadows were also the subject of investigation. They assessed temperature changes within them. They observed the effects of shadows on visibility. One of the first things the astronauts did was make observations about the impact of their boots on the lunar regolith, the dry dust and broken rock which covers the moon's surface. 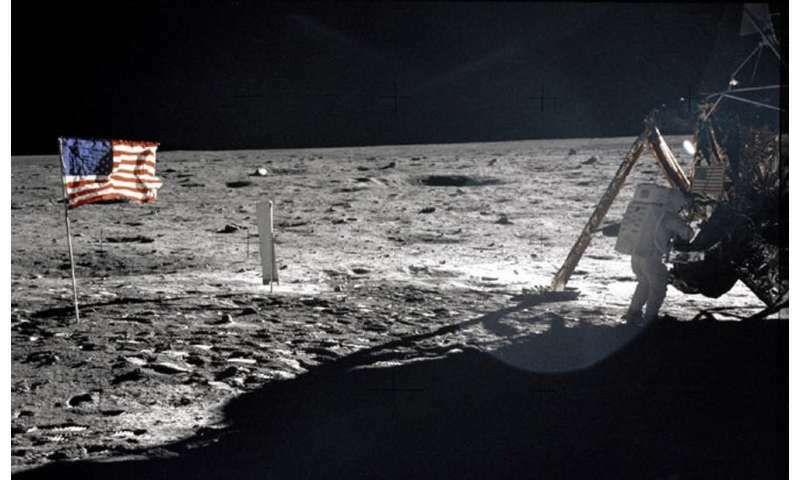 The ridges in the soles, images of which have been reproduced countless times, were in fact an experiment: the contrast between the light and shade in the ridges was a way to measure the reflectance properties of the dust, and the angles allowed calculation of the depth to which the astronauts sank into it. Armstrong commented: "It does adhere in fine layers like powdered charcoal to the sole and sides of my boots. I only go in a small fraction of an inch, maybe an eighth of an inch, but I can see the footprints of my boots and the treads in the fine, sandy particles." Over the course of the surface mission, the astronauts took over 600 images and films. In these images we see the long shadows cast by the light of the sun and Earth around the astronauts, the landing module, flag and other objects. The disposition of the shadows forms part of the corpus of conspiracy theories claiming the lunar landings were faked. It's argued that the angles of the shadows make no sense and are caused by the lighting in a film studio, where actors lumbered about pretending to be in low gravity. This very much reminds me of the counter-intuitive shadows of de Chirico's paintings. People with far greater knowledge than I have debunked the theories, but I think there's another aspect to the shadow conspiracies. Shadows conceal and obfuscate; they create illusions by distorting height and proportions, but moon conspiracy theorists look to shadows to reveal the truth. In Plato's famous allegory of the cave, captives only know the world through the shadows cast on the cave wall by people and objects moving behind them. The shadows are an imperfect and distorted reflection of the real form of the objects. In their own minds, the conspiracy theorists are like the escaped captive who emerges from the cave to perceive the true cause of the shadows. The shadows are signs that can be read, and the LRO used them to locate the six Apollo landing sites. Orbiting as close as 50 kilometres from the surface, it could see the shadows cast by the landing modules, instrument packages and even the flags. The astronaut traverses and rover tracks from Apollo 15–17 were visible as dark wiggles, like the burrowings of an insect in tree bark. There's no doubt in my mind, despite their intangible, ephemeral nature, that the Apollo shadows are a significant part of the fabric of the sites and of their cultural significance. Although abandoned by humans, the shadows mean the sites are not still. They've altered the temperature and light environment that existed in the landscape prior to the landings. It is their difference from Earthly shadows which makes them significant; they are the shadows of humans and human artefacts in the light of another world, and they bring novel geometries and textures to lunar shadow topography. Space archaeologist Beth Laura O'Leary and her team from the Lunar Legacy Project have already catalogued the artefacts at Tranquility Base; I would like to make a catalogue of the shadows. It's not only the hardware and the relationships between objects at the Apollo sites which could be damaged by careless visitation. The chiaroscuro created by the actions of these first humans could also be destroyed. 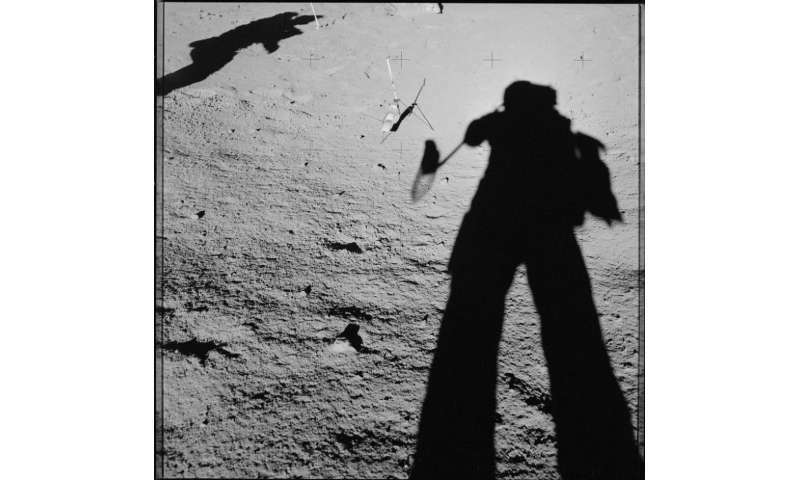 The shadows I find most compelling, though, are the shadow selfies of absent astronauts stalking on their long legs over the regolith, camera raised to their visor. They feel like Sigmund Freud's uncanny double or doppelganger, human but not quite. 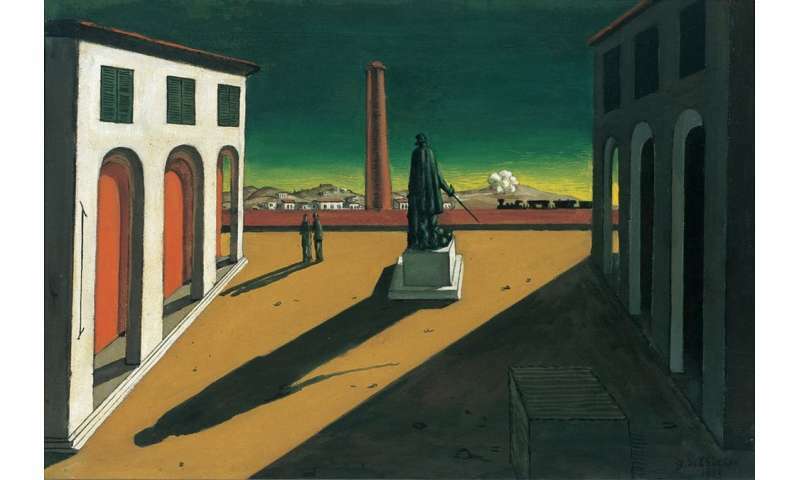 They're silent, lonely and melancholy, as if Tranquility Base were a town square in a de Chirico painting. But there is also a kind of peace. For a few decades, the lunar sites were safe from disturbance. But now everyone wants to return to the moon. Distance will no longer protect lunar heritage, if we think it is worth protecting. It's not all about science or prestige any more, either, in the era when wealth is the driving force behind space exploration. The moon has resources that entrepreneurs on Earth would like to access. These include rare earth elements, like yttrium and ytterbium, which are used in lasers, computers, mobile phones and car batteries; helium-3, which might be used as a clean nuclear fuel, and many others, such as water, which could be used to sustain a settlement on the moon in what's called In Situ Resource Utilisation. The water ice hidden in the permanently shadowed polar craters is a resource that could be used to make fuel, as well as for habitation. People are going to be analysing the shadow landscape to locate resources for future industry. Private companies have been established to pursue lunar and asteroid mining. Countries like the US and Luxembourg have put in place legislation to support commercial ventures on the moon and in the asteroid belt. People seem to accept that industry on the moon is not a matter of if any more, but when. And when it happens, there is going to be an almighty lot of abrasive, adhesive and corrosive lunar dust stirred up as rockets and rovers come and go. The future of lunar heritage is at risk. My years of working in the terrestrial mining industry have suddenly become relevant to the future of space exploration. I think off-Earth mining companies are overlooking some critical processes. Disturbing the surface of the moon at an industrial level could have a negative impact on its cultural significance for the entire population of Earth. This is even before you consider possible damage to the lunar landing sites of many nations. There is an urgent need to develop an environmental management framework for space, and cultural heritage must be part of this. Space archaeologists have an important role to play in the next phase of human engagement with the solar system. There are innumerable technical problems that need to be solved to have a viable lunar industry, but there's one big one that affects everything we might do on the moon. The Apollo astronauts found that lunar dust stuck to them and wouldn't come off. It clogged up their equipment seals and caused mechanical equipment to stop working properly. It coated instrument faces so that they couldn't be read – and this was after just a few days. We think of the astronauts in blindingly white spacesuits, but they ended up covered in dirt, much like an archaeologist in the trenches. The dust contains tiny, sharp spicules of obsidian, a natural glass, that are very abrasive. It's also electrostatically charged from constant bombardment with solar particles and cosmic rays – there's little atmosphere to protect the surface, as we have on Earth. This makes it highly adhesive. With space vehicles ferrying equipment, personnel and commercial products between the moon and Earth, there's going to be a lot of dust blown around. If solutions aren't found to control it, it's even possible that it will be blown up into lunar orbit and create a dust cloud around the moon. This is a critical problem to solve before any industrial activity takes place. John Young, the Apollo 16 commander in 1972, said, "Dust is the number one concern in returning to the moon." 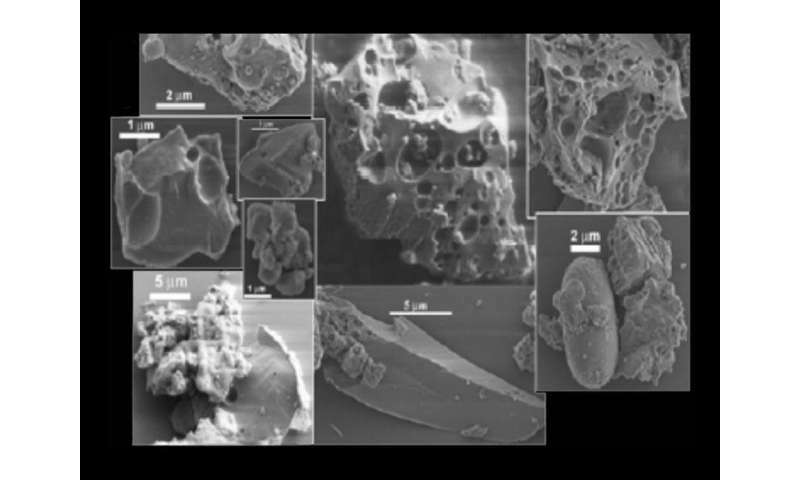 Naturally the dust problem has occupied the minds of scientists working on lunar mining systems a great deal. Proposals to mitigate dust damage include building blast walls to contain it, fusing the dust into landing pads so that rocket take-offs and landings don't blow it around, and creating materials that repel it. Some of these proposals will also minimise dust abrasion damage on historic lunar spacecraft. 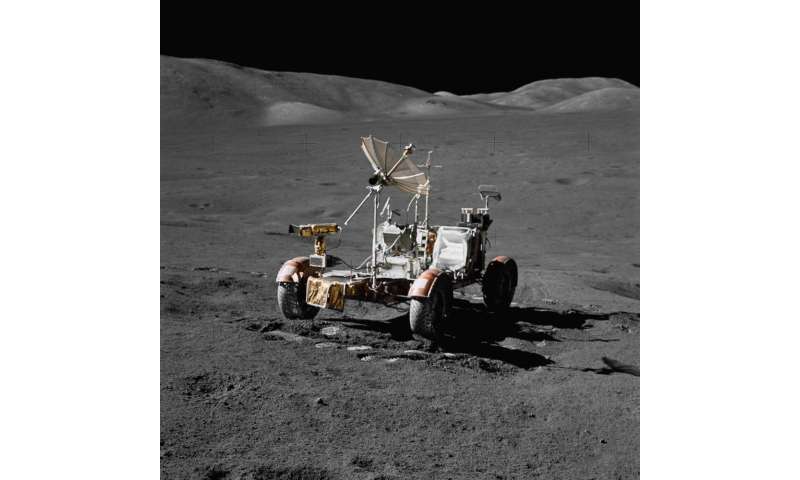 This is a rare occasion where the research needed to develop lunar resources also helps us protect some of the most significant sites of the 20th century. So there is some hope that we can ensure that the early history of human adaptation to space environments is not erased. This still leaves the bigger question. What about the moon itself? How will people feel if they look at the moon in the night sky, and know that it is being mined before their eyes? The moon is a universal cultural symbol that unites us from the earliest human ancestors millions of years ago into the deep future of humanity. So far, all lunar missions have been small-scale and scientific. The presence of human sites, which we can't see from Earth even with the most powerful telescopes, has not diminished the intangible heritage of people's beliefs and dreams. But it might be different when we know that private corporations are making a profit from digging up the moon. The Bingham Canyon copper mine, owned by Rio Tinto and located in Utah, is the largest open-cut mine pit in the world. It's been in production since 1906. What started as a tiny pit is now four kilometres across, 1900 hectares in area, and 1.2 kilometres deep. Imagine something like this – but on the moon. How would we feel if we could see a similar human-made crater from Earth—whether through telescopes or satellite images? We shouldn't allow ourselves to be taken by surprise. We should be prepared for changes to the moon we think we know – to have to make new meanings for it, as we have had to for Earth and other places in the solar system, like Pluto. The Anthropocene era involves redistributing minerals and elements in a way that's geologically visible. If lunar mining goes ahead, there is going to be even more redistribution and exchange of terrestrial and lunar materials. The search for water ice on the moon will be a journey into deep cold shadows at the poles which have lain undisturbed for as much as 3.6 billion years. Compared to this, the Apollo shadows are mere blips in lunar history. Shadows on the moon create a symbolic landscape which can be read in many different ways. For me, Japanese novelist Junichiro Tanizaki, in his work In Praise of Shadows, captures the essence of these otherworldly shadows perfectly: "And yet, when we gaze into the darkness that gathers behind the crossbeam, around the flower vase, beneath the shelves, though we know perfectly well it is mere shadow, we are overcome with the feeling that in this small corner of the atmosphere there reigns complete and utter silence; that here in the darkness, immutable tranquillity holds sway."